Program that rescues women from substance abuse, incarceration and poverty begins again. ​After 25 years of helping women resurrect their lives after spending time in prison, it would have only made sense for Diane Gaines to settle into retirement, satisfied with a job well done. But when Gaines, a 1997 Robert Wood Johnson Foundation (RWJF) Community Health Leader, realized that no one was coming forward to fill her shoes, she chose a tougher path. “When we lost our funding for the Women’s Opportunities Resource Center (WORC) program, I knew we had helped a great many women [more than 1,000] here in Hempstead, Long Island and the surrounding areas, but I never expected the outpouring of requests from the community, the women’s bar association, even judges for us to find some way to re-open the program,” Gaines explains. The push to revive WORC was fueled by recognition—among people who had come to know WORC graduates—of the program’s amazing ability to help women discover the road to healthy, happy, high-functioning lives. “Roughly 50 percent of the women who come to WORC do not have high school diplomas, so we often help them obtain their GEDs,” Gaines says, but that’s just a small part of the program. “Many of them have very low self-esteem and have endured sexual or physical abuse. These are women who have not felt empowered to do positive things on their own. We teach life skills, financial literacy, job skills, vocational training, as well as classes on nutrition, HIV/AIDS prevention and staying healthy. ”While Gaines’ motivation clearly comes from the heart, she makes a strong business case for the program. “WORC gives female offenders the opportunity to pay their debt to society without being incarcerated, saving taxpayers thousands of dollars. In addition, most of the women are mothers,” Gaines explains. “Most of the time, when you lock up a woman, you lock up a family. WORC greatly reduces the need for these children to be placed in foster care and helps families become independent of public assistance. ”The need for programs like WORC is clear at a time when there are more than 1.2 million women in prison or jail in the United States, according to the Women in Prison Project. Statistics reveal that a great many of the women have undiagnosed psychological problems and struggle with addiction and poverty. Yet, WORC’s track record is proof that these women can succeed with support, education and encouragement. “Before I came to the program, I had been homeless and a drug user for at least 14 years,” explains Victoria Roberts, a WORC graduate. Like so many women who go to prison, Roberts’ children suffered along with her. “I used drugs during my older son’s entire childhood and my youngest was born addicted. When he was a baby, I was told he would have learning disabilities. ”But that was before Roberts discovered WORC. “When I began attending classes there, I had no idea that I had low self-esteem. No one had ever discussed that with me before or even asked me to be honest about how I really felt about myself. Once I began to really talk about the stresses in my life and how little I liked myself, that’s when I began to change. ”Today, Roberts is a legal assistant in an attorney’s office in Long Island where she and her husband own a home. Her oldest son works with her and her youngest is smart, healthy and now a senior at the State University of New York at Albany. “My kids were able to change their lives, because I changed mine,” says Roberts, who is so proud of her boys that even her email address is “Kaleel’s mom,” a small tribute to her youngest son. Her grassroots efforts raised $23,000, enough to get WORC up and running with a volunteer staff. In 2012, the program was given 501C3 status, but Gaines is still on the road. “I will speak anywhere and go anywhere, if they are interested in our work,” she says. In meeting Ms. Gaines, just being in her presence and seeing all she has to overcome just to come to work every day, though she never complains, made me realize that I could succeed,” explains Kim Harris, a WORC graduate who turned her life around after a decade of battling addiction and repeated incarcerations. “I also travel with her sometimes and attend the annual Robert Wood Johnson Foundation Community Health Leader meetings with her. That also inspires me because it gives me the chance to see how professional people work together and assist each other,” Harris adds. Each year, the Robert Wood Johnson Foundation selects 10 Community Health Leaders to receive an award. The winners are outstanding and otherwise unrecognized individuals who overcome daunting odds to expand access to health care and social services to underserved populations in communities across the United States. The program aims to elevate the work of these unsung heroes through enhanced recognition, technical assistance and leadership development opportunities. Video journalist, Archie Snowden covers the work that WORC does for it's community! Click the link above to watch. “Social justice, community activism,” she adds, “that’s what we were borne out of. And with the climate in the country now, we’re even getting ready to do it on a much larger scale.” Check out this link to hear about the social justice mindset WORC carries! 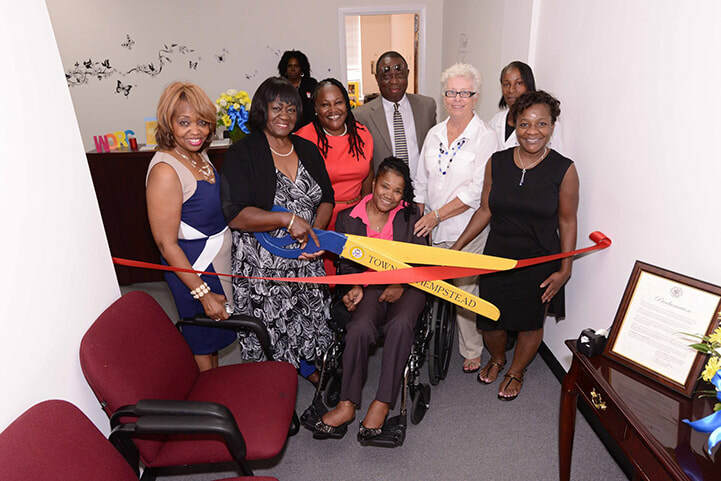 "The Woman’s Opportunity Rehabilitation Center, WORC, hosted a Grand Opening Ribbon Cutting, at their new office space at 91 North Franklin Street in Hempstead. I was so pleased to take a tour and congratulate Diane Gaines, Executive Director, and board members"
Port Washington Patch - Port Volunteers Help Woman’s Opportunity Rehabilitation Center. The Center will present 'Hairitage, the Journey of Sistahs with Their Hair' at Molloy College on June 21.